Whether you're repairing your bar tap handles or making your own custom tap handles, you'll need this ferrule to connect them to your draft faucet. This decorative silver ferrule will upgrade any tap handle display. Ferrules are the pieces that connect your tap handle to the the draft faucet. You may need some of these beer tap handle parts on hand if you're replacing a damaged tap handle insert or if you want to make your own custom tap handles. This decorative silver ferrule will add an extra level of shiny flair to your tap handle display. These ferrules are designed with 3/8" - 16 UNC standard tap handle threads on both the top and the bottom for easy installation. Since they're designed to fit any standard draft faucet, you can replace an old tap handle and/or install a new one atop this ferrule very easily: just screw onto the faucet lever collar to attach to your beer faucet. Your generic, novelty, or custom tap handle will truly pop when you add this silver, curved tap handle ferrule! Turning is rewarding and fun. The stepped shoulder inside ensures a tight positive fit..Very nice item. A smaller size would be cool to make smaller profile tap handles. Fit my ceramic tap handle perfectly. Looks and works as intended. I make custom tap handles for clients and these ferrules really add a nice classic look to my finished tap handles. 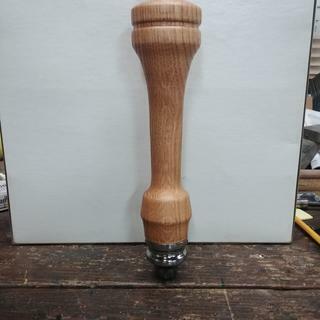 Making a custom tap handle. 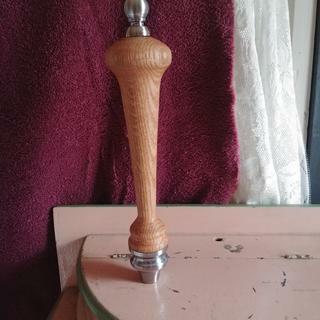 replacing plastic tap handles with wood turned handles from exotic woods and I wanted the larger ferrule size which is almost 2 inches versus the small standard ferrules of 3/4 inch. 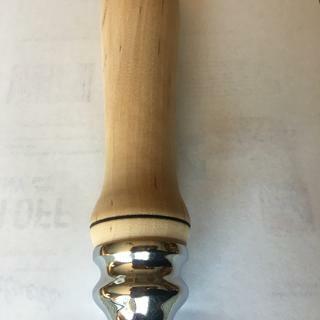 Making a custom tap handle for relative. Carving a tap handle for a keezer as a Christmas gift.